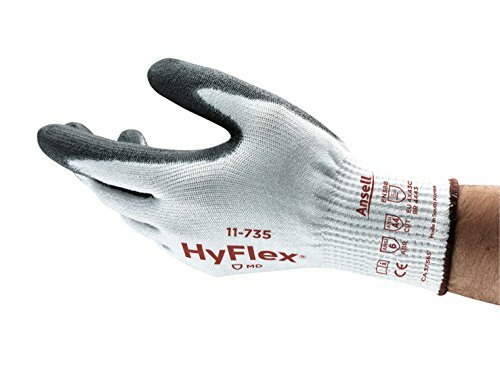 Ansell 11735090 Hyflex 11-735 Medium Duty Cut Resistant Gloves, Size 9 by Ansell at tradingmart.net. MPN: 11735090. Hurry! Limited time offer. Offer valid only while supplies last. The HyFlex 11-735 features a lightweight liner with INTERCEPT TECHNOLOGY which provides ANSI Level A4 protection while delivering extreme durability. The HyFlex 11-735 features a lightweight liner with INTERCEPT TECHNOLOGY which provides ANSI Level A4 protection while delivering extreme durability. The soft, cool, flexible liner provides all day comfort while working on such tasks as laying block, working under your car's hood, fixing drywall or maintaining your appliances. If you have any questions about this product by Ansell, contact us by completing and submitting the form below. If you are looking for a specif part number, please include it with your message. Ansell 11-511-10 Size 10 HyFlex 11-511 Medium Duty Cut and Abrasion Resistant Green Foam Nitrile Palm Coated Work Gloves with Intercept Technology Dupont Kevlar Liner and Knit Wrist, 1" x 9" x 5"